Each summer, prior to an NFL season, HBO gives us a little entertainment in the form of Hard Knocks which graces our screens and helps us with an insight into the lives and experiences of National Football League stars. The show brings to light the activities of stars as well as fringe free agents during camp training. Amazingly, the American football quarterback, Brogan Roback, who plays for the Pittsburgh Steelers has garnered huge fame through his appearance in the 13th season of the popular HBO show. Know all about Brogan’s background details, family, girlfriend, and body stats below. Brogan Roback is an American football star who plays the role of a quarterback for the Pittsburgh Steelers of the NFL. He was born on the 24th of August 1994 and his birth took place in Maumee neighborhood of Ohio in the United States. A delve into his academic background and qualifications show that he acquired his early education at St. John’s Jesuit in the city of Toledo, Ohio and he is an alumnus of Eastern Michigan University where he played collegiate football. During his college days, Brogan Roback was said to have made good statistics as he was seen in a total of 46 games and his completions came to 745 for yards measured at 8, 653 with 57 touchdowns. In addition, he also played as a punter and his college experience led him to make quite a good impression as an undrafted rookie for his unchained arm strength as well as oddball personality. From all indications, Brogan Roback has not been so favored in his professional stint in the National Football League. After going undrafted in the NFL draft of 2018, the sportsman went on to sign up with the Cleveland Browns as a free agent. He joined the Browns on the 14th of May 2018 and was unable to make the team’s active roster. Later on, in August he was released by the Browns. Undeterred, Brogan Roback quickly connected with the Pittsburgh Steelers, who later offered him a reserve/future contract with the team on the 3rd of January 2019. While the quarterback has been striving to make the Steelers starting rooster, his name still goes down in the history of Eastern Michigan’s football team as one of the school’s most skillful quarterbacks. In viiew of that, we hope that Roback will earn an opportunity to prove himself in the NFL soonest. The American football star came from a lineage of football players, this explains why he is able to pull a lot of stunts during his collegiate career. He is the son of William Roback and his wife, Ronda Roback. His father was said to have played collegiate football during his days at Western Michigan University. It is also known that he has a sister named Paige, who like Brogan, is sports inclined and she also played volleyball for Eastern Michigan University. However, his mother’s profession is not known as it has not been revealed. Does Brogan Roback Have A Girlfriend? 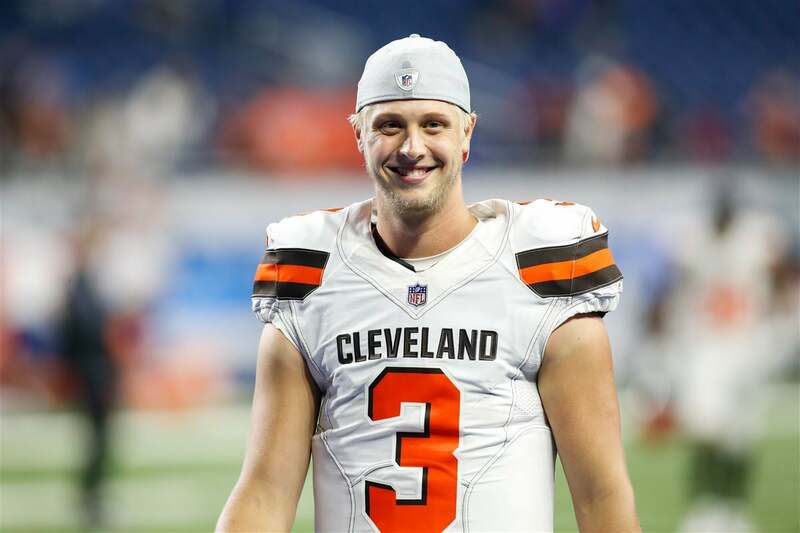 Regarding his relationship, the details of the player’s past dating life are not known but currently, Brogan Roback is in a relationship with Ally Goff – the Hard Knocks star who stole the spotlight in the last few episodes of the show. The pair are college sweethearts and was said to have reportedly started their relationship during their days at Eastern Michigan University. At the time, Ally was a part of the school’s track and fields sports team. Ally is originally from White Lake, Michigan and is the daughter of Barbara and Anthony Goff. She grew up along with her brother named Anthony and graduated from Eastern Michigan with a Marketing major. Although the pair hasn’t shared many details regarding their relationship, it is believed that they are still going strong. Just as expected from a typical NFL player, Brogan Roback has a great height as he stands at a gigantic height of 6 feet 3 inches or 1.90 m with a commensurate body weight of 98 kg which is approximately 215 lbs. His body build is definitely athletic but there are no details on his general body statistics like chest, waist, and biceps. We equally don’t have the details of his shoe and cloth size, however, his body size has been described as a good one for a professional quarterback. Brogan Roback is equipped with exceptional arm strength as well as mobility that has been described as above-average. It is also worth knowing that the player has fractured his fibula in the past but got back on his feet through the necessary medications as well as vigorous workouts.